Small and multi-functional furniture are wise decorating choices for tiny houses. ​ Use your space wisely for optimal daily living and functionality. Corner furniture, small tables, fold-up furniture, and more, will all work well in a tiny house. 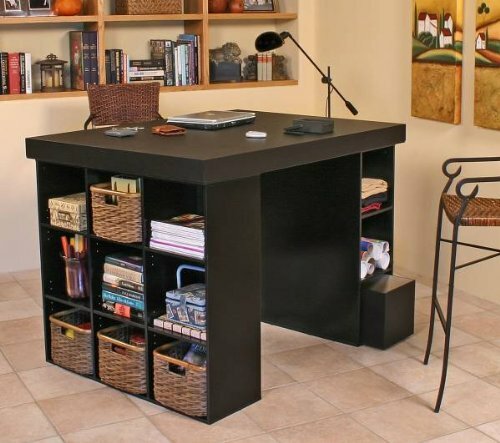 ​This small desk has areas for your computer, books, and other items. It offers ample shelves and storage areas, which is perfect for small space. The Project Center's ingenious design makes it perfect for studying, sewing, crafting or scrap booking. This version includes a top, plus one bookcase and one 3-bin cabinet for support. They are open at both ends. Project Center is comprised of 3 main components: Table Top, 9 Shelf Bookcase and 3 Bin Storage Cabinet. ​ these bedroom furniture pieces are ideal for any tiny house! The cabinets can be used anywhere. ​This tiny furniture should fit well in your tiny house. It is space saving, and some can work in multiple places throughout your home.. Visit our APPLIANCE page for appliances for tiny houses. Hayneedle offers a huge variety of home goods at great prices, plus they offer free shipping when you spend a minimum amount there. This small furniture is ideal for your tiny house!